WASHINGTON, DC, November 21, 2013 (ENS) – After more than 100 years, Atlantic sturgeon are spawning again in the Chesapeake Bay. 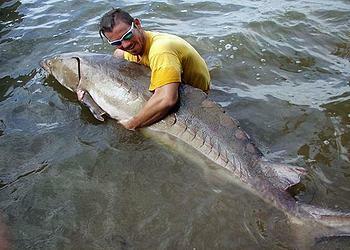 First noted by a single fisheries biologist in 1997, the number of sturgeon that spawn in Chesapeake Bay has grown. In 2012 that distinct population was added to the federal Endangered Species List. Now scientists are racing to find out what is driving the sturgeon’s recovery so they can reinforce it. NOAA Fisheries has awarded a three-year, $1.75 million species recovery grant to the Maryland Department of Natural Resources and the Virginia Department of Game and Inland Fisheries. Atlantic sturgeon were prized for their flesh and for the caviar made from their roe. But fishing for them in the Chesapeake peaked in the 1890’s, and no one alive today has seen a healthy run of sturgeon in the Bay. Even basic information about their life history has been forgotten, a problem for the scientists working to protect them. “We need to find out where they’re spawning so we can protect that habitat,” said Dave Secor, the young fisheries biologist who first discovered the spawning sturgeon in 1997. But finding their spawning grounds is difficult because there are so few of them out there. Scientists will use the new funding to tag about 240 sturgeon with acoustic transmitters so they can track the movements of the big fish. Atlantic sturgeon spend most of their time at sea, travelling up and down the shelf break where they plow the bottom with their snouts, eating worms and crustaceans. Like salmon, they return to their natal streams to spawn. Unlike most salmon, however, which spawn once and die, sturgeon make the spawning run repeatedly. They can live up to 60 years and can grow up to 14 feet and 800 pounds. Matt Balazik, a postdoctoral fellow at Virginia Commonwealth University, is doing most of the tagging. The acoustic tag, about the size of a Sharpie marker, is inserted into the belly of the fish through a small incision. The minor surgery takes less than five minutes, and the fish are quickly released. The tag emits a coded sound roughly once a minute, and the signal is recorded when the fish passes within range of a receiver. Each tag has a unique acoustic signature, allowing scientists to track individual fish. Scientists also hope to locate their nursery grounds and to identify the biggest threats to their recovery such as ship strikes and poor water quality. The tagging project got a boost from the Navy, which has installed an array of 58 receivers, most attached to Coast Guard buoys, across the mouth of the Chesapeake Bay. The Naval Base at Norfolk, Virginia is the largest in the nation, one of several naval installations in the lower Chesapeake Bay. As a federal agency, the Navy must minimize interactions with endangered species. Before 1890, when a sturgeon fishery began,an estimated 20,000 adult female sturgeon inhabited the Chesapeake Bay and its tributaries. Today, syas NOAA, the James River spawning population is estimated at fewer than 300 fish. WASHINGTON, DC, November 21, 2013 (ENS) – The nuclear power industry is applauding a federal appeals ruling that orders the U.S. Energy Department to ask Congress to suspend collection of fees for the Nuclear Waste Fund. The fund was created to pay for management of the nation’s used nuclear fuel, but the Energy Department terminated the Yucca Mountain nuclear waste repository project in 2010, in part over environmental concerns. The unanimous ruling by the U.S. Court of Appeals for the D.C. Circuit released November 19 says that the fees must be suspended until the Energy Department complies with the Nuclear Waste Policy Act or Congress enacts a new nuclear waste management program. Congress established the Nuclear Waste Fund to support the development of a permanent geologic repository for used nuclear fuel. Consumers pay one-tenth of a cent per kilowatt-hour of electricity generated with nuclear energy. The fund collects $750 million a year, has a balance of about $30 billion and annually accrues about $1.5 billion in interest. The Nuclear Energy Institute, an industry association, and the National Association of Regulatory Utility Commissioners seek to suspend the fee until there is an active nuclear waste program in place. Attorneys for the federal government argued that the court should not order the fee set to zero because petitioners are already being compensated for the government’s breach of its statutory and contractual duty to dispose of existing waste, through breach of contract suits in the Court of Federal Claims. The nuclear power plant operators are currently storing their waste at the generation facilities, and the government is compensating them for the cost of this storage. “The issue here, rather, is the government’s failure to conduct an adequate present fee assessment, as required by the statute. Our ruling here does not provide petitioners with any form of compensation, nor does it relieve them of their obligation to ultimately pay for the cost of their waste disposal,” wrote Judge Silberman. The ruling “confirms that the federal government cannot continue to defy Congress’ explicit direction to implement a viable program to manage reactor fuel from America’s nuclear power plants,” said Ellen Ginsberg, Nuclear Energy Institute general counsel. WASHINGTON, DC, November 21, 2013 (ENS) – The Republican-controlled U.S. House of Representatives voted again Wednesday on legislation granting favors to the oil and gas industry. By a vote of 235-187, House members approved HR 2728, the second in a series of pro-industry, anti-environment bills up for a vote this week. None of the bills are expected to be taken up by the U.S. Senate. HR 2728, the “Protecting States’ Rights to Promote American Energy Security Act,” would prohibit the Department of the Interior from enforcing any federal regulation, guidance, or permit requirement regarding hydraulic fracturing, or any component of that process, relating to oil, gas, or geothermal production activities on or under any land in any state that has regulations, guidance, or permit requirements for that activity. Instead, if the bill were to become law, the Department of the Interior would have to recognize and defer to state regulations, permitting, and guidance. Among other things, HR 2728 would delay the Environmental Protection Agency’s study on impacts of hydraulic fracturing, or fracking. During fracking drillers blast millions of gallons of chemically treated water underground to release oil and gas. The controversial practice has been linked to air and water pollution and public health problems. HR 2728 would eliminate baseline federal protections for public lands from fracking and keep data about water contamination from families living on and near fracking sites. “With recent polls showing opposition to fracking growing even higher, and voters in Colorado approving a series of bans on the practice, the House Majority Leadership is demonstrating, once again, how out of touch with voters it’s become,” said Ennis. Also on Wednesday, the House passed a bill that prioritizes fossil fuel extraction over every other use of America’s public lands, including hunting, fishing, protection of water supplies, and wildlife habitat. By a vote of 228-192, House members approved HR 1965, the “Federal Lands Jobs and Energy Security Act,” which would fast-track drilling permit approvals on public lands and turn over many public lands management decisions to the oil and gas industry. HR 1965 would earmark $50 million for matching funding for joint projects with states to conduct oil and gas resource assessments on federal lands with significant oil and gas potential during fiscal years 2014-2017. CHARLOTTE, North Carolina, November 21, 2013 (ENS) – Bank of America announced today that it has issued a “green bond” consisting of a three-year, fixed-rate bond that is $500 million in aggregate principal amount. This issuance is “part of the company’s ongoing commitment to advance renewable energy initiatives and promote energy efficiency,” the bank said in a statement. Bank of America’s green bond is a senior bond where the funds will be used specifically to finance green investments such as renewable energy and energy efficiency projects. Bank of America viewed this issuance as an opportunity to expand its investor base and to support an important market as investors seek more socially responsible investment options. Many investors participated, including: AP4, BlackRock, Breckinridge Capital Advisors, California State Teachers’ Retirement System, Calvert, Pax World Management, Praxis Intermediate Income Fund, State Street Global Advisors, Standish Mellon, TIAA-CREF and Trillium Asset Management. NORTH CHARLESTON, South Carolina, November 21, 2013 (ENS) – A wind energy testing facility that is the nation’s largest and one of the world’s most advanced, was opened today in North Charleston. U.S. Deputy Secretary of Energy Daniel Poneman joined with officials from Clemson University to dedicate the new $107 million facility. Led by Clemson University’s Restoration Institute, the facility will help test and validate new turbines, particularly for offshore wind. Wind testing facilities are attracting companies from around the world to design and test their turbines and creating new jobs and opportunities for American workers and businesses. During President Barack Obama’s first term, the United States more than doubled generation of electricity from wind, solar and geothermal sources. To ensure America’s continued leadership position in clean energy, the President has set a goal to double renewable electricity generation once again by 2020. “This facility is about job creation, sustainable growth and energy independence, while building the infrastructure to power America’s economic growth and prosperity for years to come,” said Congressman Jim Clyburn, a South Carolina Democrat. Located at a former Navy warehouse with easy access to rail and water transport, the Clemson facility will test machinery that converts both onshore and offshore wind to electricity and allow engineers to simulate 20 years’ worth of wear and tear on drivetrains in a few months. The facility’s proximity to the coast also makes it ideal for U.S. and international companies to testing larger offshore wind turbines. Supported by a $47 million Energy Department investment as well as about $60 million in outside funding, the facility is equipped with two testing bays and a grid simulator that mimics real-world conditions. TRENTON, New Jersey, November 21, 2013 (ENS) – The New Jersey Department of Environmental Protection is administering a $2.375 million grant from the U.S. Environmental Protection Agency to help owners and operators of regulated underground fuel storage tanks damaged by Superstorm Sandy, Commissioner Bob Martin announced today. The federal Leaking Underground Storage Tank Trust Fund provides states with funds to investigate and cleanup discharges resulting from federally regulated USTs. New Jersey is receiving its supplemental funding through the Sandy Recovery and Improvement Act of 2013. The state is contributing a 10 percent match to the grant, bringing total funding to more than $2.6 million. Work covered by the funding includes site assessment and cleanup of discharges. Remedial systems, such as soil vapor extraction, misting and pumping systems, are covered, as are tank and soil removal, though replacement of infrastructure, soil or concrete is not.